The study presented at this conference on tourism trade between China and Cuba2 presents an interesting perspective on China, which appears to be an ever increasing economic presence in Latin America and the Caribbean. The novel forms that this Chinese presence has taken in the region, including through bilateral aid agreements, and strong foreign direct investment (FDI), opens up wide scope for research into the costs and benefits for these economies, including in the area of tourism. Nevertheless, it would seem that while tourism is likely to grow in the region and in Cuba, there are difficulties in establishing the tourism sector as a strong link between China and Cuba. 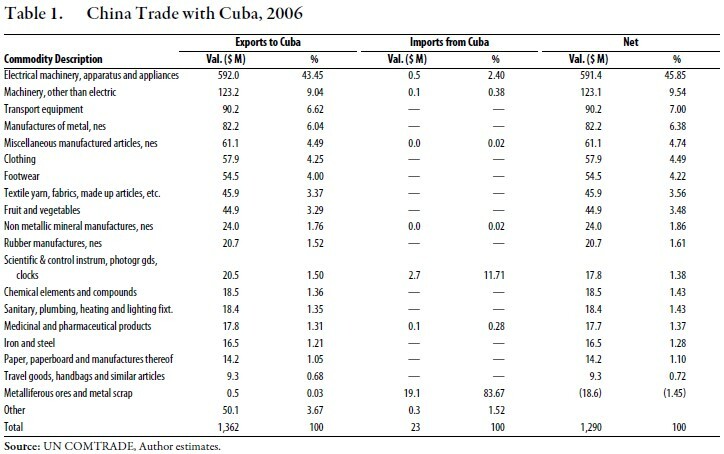 Table 1 shows trade flows between Cuba and China from the United Nations Comtrade data base, broken down by sector, for 2006 (the most recent data available at the time of writing). Nearly 85 percent of Chinese imports from Cuba are classified as metalliferous ores and metal scrap, of which the lion’s share is likely nickel exports. Cuba, like other regional commodity exporters, has benefited from Chinese commodity imports in support of its industrial production and development. The second most important category of imports from Cuba is scientific and control instruments, which captures 11 percent of exports to China. This category could suggest a potentially competitive export sector in Cuba which capitalizes on its highly educated workforce, and is a high value-added product. Nonetheless, Cuban imports from China overwhelm Cuba’s exports to China, resulting in a merchandise deficit (negative balance) exceeding USD 1.2 billion for 2006, according to these data. Most Cuban imports from China are manufactured and industrial items, such as electric machinery, appliances, transportation capital goods, and many others. There are two interesting questions that could be asked when viewing these data. The first is to find a measure of the extent to which Chinese manufacturing imports have improved the standard of living in Cuba, through its buses, rice makers, bicycles, TV sets and other imports. Without these low-cost products, the scarcity of consumer goods in Cuba would likely be even worse than it is now, and it is interesting to know how much worse. Second, as one reads deeper into the list of Chinese imports, categories such as fruits and vegetables and medicinal and pharmaceutical products appear. These are surprising import categories for a tropical country with large agricultural and biomedical sectors. It would be interesting, although admittedly difficult, to know the extent to which the competitive advantages in these two sectors have eroded so that importing form China is a viable alternative. Turning to tourism, Chinese citizens visiting Cuba outnumber their Cuban counterparts visiting China by more than twice (Table 2). 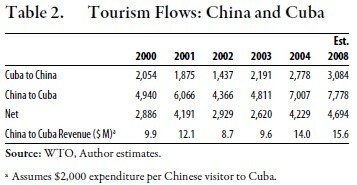 The net number of Chinese tourists visiting Cuba in 2004 is only 4,694. Even assuming the gross Chinese inflow of 7,778 tourists and US$2,000 per tourist in expenditure, Cuba would stand to gain about US$15 million from exporting tourism services to visiting Chinese. This is a small sum relative to the US$1,290 million necessary to pay for Chinese imports. Moreover, a Beijing-Havana flight costs roughly US$2,000, which represents over 10 percent of income for the top 5 percent of income earners.3 In addition, transporting a large enough number of Chinese to Cuba presents serious challenges in terms of airline flight infrastructure. Hence, it seems difficult for Cuba to capitalize on its tourism competitiveness via Chinese tourists, and instead, this sector is likely to focus on clients who are closer by, such as U.S., Canadian, and Latin American tourists. In summary, the commodity exports potential of Cuba is an interesting question in terms of studying the economic relation between Cuba and China, and the biomedical sector is as well, as it represents a valueadded export. A further interesting question would be measuring the improvement in living standards in Cuba from Chinese imports. As far as tourism from China, it is likely to be marginal relative to the potential for tourism from regional OECD countries, such as the United States and Canada, and these are more likely future sources of external financing for Cuban trade deficits with China. 1. The views expressed herein are those of the authors and should not be attributed to the IMF, its Executive Board, or its management. 2. Editor’s comment: The referenced article is Terry Maris, “Cuban Tourism: The China Factor.” It was not submitted for publication in Cuba in Transition. 3. China Statistical Yearbook’s urban household survey shows the highest income groups earning roughly between US$2,600 and US$6,000 depending on the income strata, and assuming a household size of 3, household income is between US$8,000-US$18,000.